Todd Davis promised to protect his customers from cyber criminals and thieves looking to steal personal and financial data. He believed in his product so, naturally, he used it himself. There was just one problem–It failed to protect him. 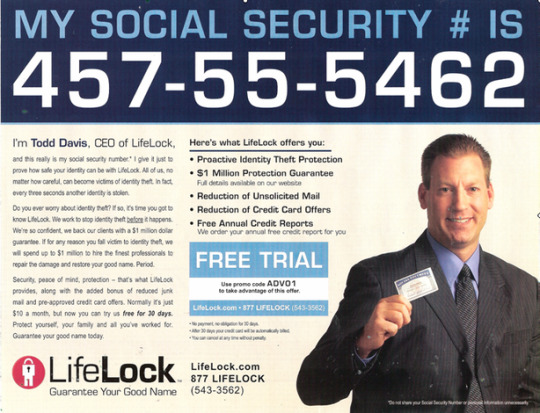 You might know Todd as the founder of LifeLock. He’s the guy that published his real social security number on billboards, trucks and websites. It was clever marketing, for sure, but it didn’t take long for the naysayers and skeptics to pounce. Someone in Ft. Worth used his social security number and his wife’s cell phone number to get a $500 dollar loan. As soon as the story broke, the negative PR was overwhelming. But that was just the beginning. Davis admitted there were 87 attempts to use his information fraudulently, while news outlets like Wired stated he was successfully hacked at least 13 times. Your business is in the same position. You’re surrounded by customers who want to see you fail. But hopefully they aren’t your customers. They’re usually with the competition (and sometimes they are the competition). This conflict is caused by ingroup favoritism. Ingroup favoritism is the preference or favoritism people show towards someone that’s part of their group or club. If they’re not part of your club or they’re in an outgroup, they’re viewed as a problem or threat. For customers not part of your ingroup, watching you struggle and fail is great. It confirms to them that they’re in the right group. They feel their choice is superior or better in some way. Though we’d never admit it many of us want to see our rivals fail. For many outgroup customers who’ve chosen a competitor over you, nothing gives them more satisfaction than to see you fail. It’s a bizarre form of validation that says “I knew what I was doing” or “I made the right choice” (even if they didn’t). Take Apple vs. Android. Many Android users think Apple customers are brainwashed, that they’re part of a cult. Android users create hate groups, write angry blog posts and freely admit that they hate Apple. They create wave after wave of objections. They pounce on any perceived flaw or failure. Outgroups want to see you fail. And they work towards it by spreading fear or doubt. They share their objections everywhere. They write blog posts, post reviews and tell their friends. They may not be your customers but their goal is the same, to shut you down. If you’re unprepared, outgroups can do lots of damage to your business. Customers who want to buy pause when they hear objections from those who won’t buy. Fear and doubt manifest themselves as objection and risk. Because customers use fear and doubt to avoid making mistakes. It’s a scary but natural part of every new transaction (even when the offer is free). This means your business needs an antidote to relieve both the fear and doubt coming from your outgroup. You relieve customer fears with risk reversals. If customers are afraid they’ll lose their money, offer a money back guarantee - take their risk and make it your own. Eliminate doubt with clear answers to their objections. Use FAQs, testimonials, demos - anything you can - to present your case. Dealing with these issues gives your ingroup – the customers who want to buy – the information they need to deal with skeptics. That’s really important because customers get the pre-sale jitters when it’s time to commit. So they ask for a second opinion, often from skeptics. When you defuse objections and offer risk reversals, you give your customers the tools they need to answer skeptics. And here’s the beautiful part. When it’s done right, your customer begins to sell skeptics on your product or service. Once they’ve done this, they’ve publicly and psychologically committed themselves to buying. Don’t let your outgroup dump fear and doubt on your customers, protect them. Share the whole story, your story, with them. Answer their objections clearly and completely. Reverse any risks to your customer; make it easy - emotionally and mentally - for customers to choose you. Don’t let your customer’s fear and doubt decide for them. LifeLock did and they were blindsided by it. They didn’t have a plan for the fear and doubt their skeptics planted and they didn’t have a plan to deal with the fallout. They lost a whole lot of customers and credibility as a result. There’s no reason for you to be caught off guard. Skeptics scream louder as your business grows. Use the fear, doubt and despair your outgroup gives you to win customers over one-by-one.